“I’ve been on a diet all of my life,” I was stunned when one of my VIP clients said this to me on our initial call. It broke my heart to think that she’d been restricting and depriving herself for so long. All on the basis of her weight being her measure of success. For her the number on the scale defined a good day or a bad day before it hard even started. For her relationship with food was a battleground. She was a slave to food, there was good, food, bad food, naughty food, calories to count and ingredients to avoid. For most of her life she’d deprived herself and used food as away to beat herself up. She ate because she was bored, nervous, sad, scared, distracted. She didn’t eat because she was overtasked, anxious, freaking out. In a sense — whether she ate or not — it was almost never about the food. It was about the emotion, place, time, who she was with and what she were doing, the depth and resonance of our connection. 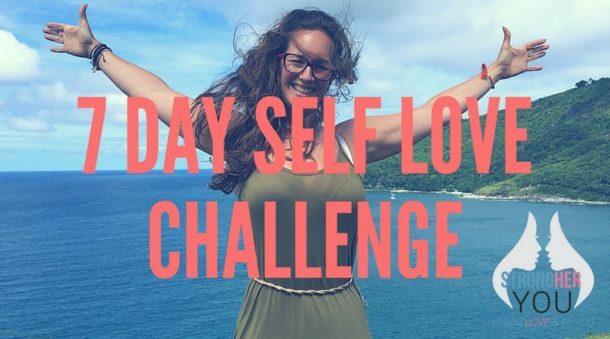 I worked with her on her relationship with food and wow it was transformational. AND there was no diet plan, no recipes and no guidelines, no calorie counting. Instead we went on a journey for her to truly and deeply know herself. We dug into her beliefs on food and where they came from. We identified her values and how eating like this didn’t align with them. We gave her systems and tactics to change her habits. We got really laser clear on what she wanted, so she could have a powerful intent. ^^^^ And by the time we finished working together, she trusted herself to eat well and with love. She ate with love, food she loved, food she enjoyed prepping and took pride in how it looked on the plate. AND she was so much of herself, she not only started to eat with love, she lost weight and then found her passion and set up her own business. It’s my belief the THING is never the THING. The reason you want to lose weight isn’t to lose weight, it’s to feel enough, it’s to be happy, it’s to reconnect with your partner, it’s to have more energy for your children, it’s to refind that love for you. For me NO one is a number, not a dress size, number on the scales or the money in their bank account or their relationship status. You are so much more than that and you are already worthy, of value and good enough. It’s my belief your relationship with food reflects your relationship with yourself, in my mind it’s a mirror. So, the more relaxed and intuitive relationship with food, the deeper relationship with more understanding that you have with yourself. Essentially that knowing and trusting yourself, knowing that you make the right decisions for you will also carry through into your relationship with food. You don’t get the life or body you want doing things you loath. That includes how you eat. So, for me the eating with love, is just another form of self-love. I’m a right old foodie and LOVE to make a great meal that I LOVE, and for me now that includes being on my own. Constant dieting and depriving yourself. Missing out and feeling guilty for overeating. Repeatedly going through the binge and diet cycle. Starting over each Monday and feeling a failure for a weekend binge. Comfort and emotional eating, eating your emotions. Eating to fuel your body for your busy days ahead. Eating to create more mental clarity and to life the brain fog. Becoming healthier to have more energy, to play with your children. Making food a passion, that you prep and plate up with love. Letting go of guilt, judgment over “bad” food choices. Essentially a loving relationship with food, is freedom. Freedom from the constant debating what to eat, how many calories are in a food and should I or shouldn’t I. AND you’ll never keep doing things you hate, so if your diet is something you can’t wait to stop. That you’re only doing for the next holiday, wedding or a reunion. That is NOT for you, there is no love or inspiration there. OHH and the word diet, if you look at the actual meaning of the word it means what you do everyday. IRONIC right. And here’s the REALLY important reason why. Our bodies are designed to eat in the rest and digest nervous system, called the parasympathetic nervous system. So, when we slow down and enjoy our food, our body sets off the process of digesting food … so saliva is produced, digestive enzymes and our hormones related to eating tell us when we’re full. BUT this ONLY happens when we eat with love, make eating an event and not just a have to. And I felt it in my body, because when we’re not connected to what we’re putting into our mouths, we don’t always make the best choices. We fill our stomachs before our body is even aware of it. We are easily influenced by others. We fall back to old habits and then beat ourselves for it. We give in to a stupid temptation that seems easy enough to avoid. Too many are us are not eating well because we’re not paying attention. Forget dieting. Forget just grabbing something on the run. Forget eating what others want. Forget guilt and judging yourself for what you eat. Instead I invite you to focus on your food, savouring rather than stuffing it down. Taking your time rather than rushing. Examine how your emotions contribute to your food intake, and what circumstances help you make healthy versus unhealthy choices. Pay attention to how you feel after you eat. What makes you feel awake, energetic, and joyful? What brings you down, and makes you feel bloated, headachy, lethargic, guilty or depressed? And for me now I love to eat intuitively, how do I feel what do I need and what will I feel good from? 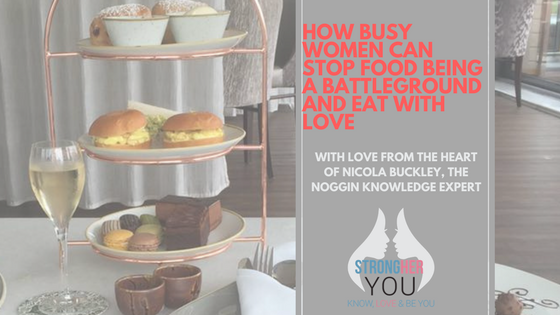 How Busy Women Can Eat with Love? How you eat and how you feel about food all comes back to your beliefs. Our beliefs are our own complicated spiders web of our framework of living life, yet all too often those beliefs are from our childhood or don’t belong to us. And part of the work I do with clients is to upgrade their belief to where they are right now. Start to drop the labels of what you COULD and SHOULD be eating. Let go of the idea that there is only one way to lose weight. The best weight loss plan for you if that’s what you want is one you enjoy and can stick to. Anything else is just down to willpower, making yourself do things you don’t really want to. AND will NEVER get a body you LOVE, doing things you hate. Love only comes from love. Instead I invite you to start to listen to your body, eat when you’re hungry, drink when you’re thirsty and listen to your body when it WANTs a particular food. This is eating intuitively and the more trust you have in yourself the more you can eat what you feel like. I love that I know can eat based on how I feel, does it make binge and eat rubbish. NO for me I rarely drink, I love steak and hearty meals and HUGE salads. It’s all about starting to trust yourself. 3) Who are you when you eat? Do you make eating an event? Do you prep your food with care and attention? Do you take care to make you food look good on your plate? Do you sit down and eat food at the table? How do you feel when you eat? Relaxed and calm? Stressed and rushed? Start to think about food you love, food you feel good from and food that leaves you full of energy and clear headed. And on the flip side food that you don’t enjoy, that doesn’t feel good and can leave you feeling bloated headachy and slow. We all have a natural way of eating that feels good for us and you’ll surprise yourself that it won’t just all be chocolate and wine! Give yourself a score for how you eat with love right now, then consider how you can plus one it. Start to engage your sense when you eat and make it an event, eat with your eyes, your sense of smell and your heart. Once you are mindful of your eating and the effects on your body and mind, then you can begin to lead a happier life. Food is such a HUGE part of life, we make around 50 decisions a week around food and drink that starting to eat with LOVE changes our life. And that new level of trust, trusting yourself to eat in a way that you love and feel good from is part of you knowing yourself. I don’t think is any one quick solutions. My journey has been a decades-long process. It took time and patience, and trusting myself and having more and more love, yet there is always room for improvement. But I found out so much about myself and, as a result, am better because of it. I invite you to meet yourself where you are and start to be kinder, more considerate and let go of food being a battleground and lead with love.